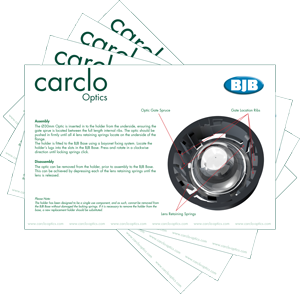 This holder has been developed to allow the use of Carclo’s standard range of Ø30mm optics with the range of Ø40mm CoB (Chip on Board) bases from BJB. A unique compact, clip together optic assembly. Beam angle range covered:- 18 to 44 deg. The Ø30mm Optic is inserted in to the holder from the underside, ensuring the gate sprue is located between the full length internal ribs. 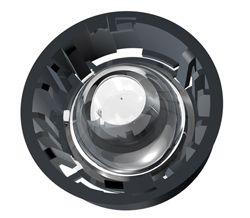 The optic should be pushed in firmly until all 4 lens retaining springs locate on the underside of the flange. The holder is fitted to the BJB Base using a bayonet fixing system. Locate the holder’s lugs into the slots in the BJB Base. Press and rotate in a clockwise direction until locking springs click. The optic can be removed from the holder, prior to assembly to the BJB Base. This can be achieved by depressing each of the lens retaining springs until the lens is released. Please click here or on the image below to view the pdf presentation. The holder has been designed to be a single use component, and as such, cannot be removed from the BJB Base without damaged the locking springs. If it is necessary to remove the holder from the base, a new replacement holder should be substituted.